IP69K Certification for STOBER – STOBER Drives Inc. The Food and Drug Administration has high standards of cleanliness for food and beverage manufacturers. Equipment that is involved in making products in these industries must be able to withstand extreme cleaning solutions. STOBER Drives Incorporated has gearboxes that can withstand the harsh washdowns required by the FDA. These gearboxes also have the option of IP69K Certification, which is the highest degree of protection in cleaning processes. Since the IP69K certification is available for several STOBER units, a large number of industries can use STOBER in their factories, including dairy, fruit and vegetable, snack foods, baking, meat processing, and more. According to the FDA’s Current Good Manufacturing Practices for meat and poultry, all equipment must be of sanitary design. It states that “the equipment must be cleanable down to the microbiological level.” To meet this requirement, units are cleaned with steam cleaners at high pressure and with scalding water. In addition, harsh chemicals may be used to meet more extreme regulations. These severe cleaning procedures often compromise the paint on the gearbox, allowing for possible contamination of the product and the gearbox. The rating given to equipment that can withstand these harsh environments is IP69K. STOBER rose to the challenge to meet the requirements for cleanliness and ensure the durability of the gearbox. With this IP69K Certification, STOBER’s line can be used in food and beverage applications across the nation. This certification shows it will provide maximum protection against high pressure washing and/or steam cleaning. No paint will deteriorate, meaning no contamination from paint chips will occur. STOBER also has stainless steel units that can withstand caustic solutions that are used for the most severe washdown applications. 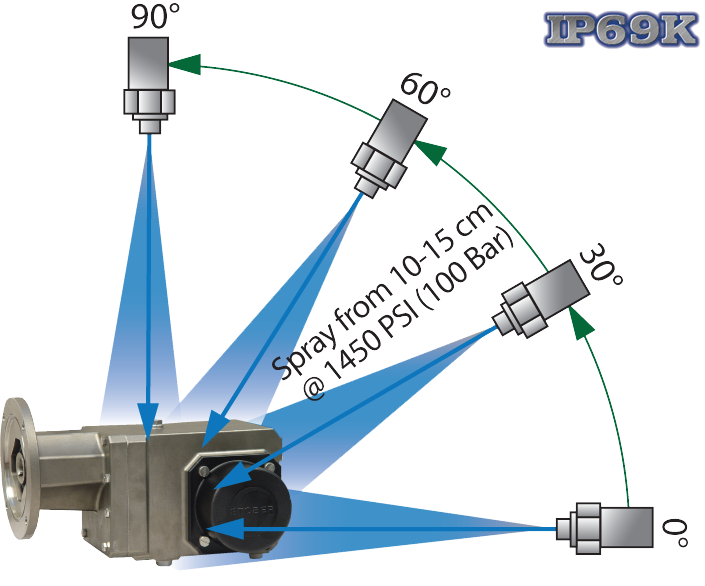 For additional information on STOBER’s IP69K Certified products, visit www.stober.com. Information on the Current Good Manufacturing Practices was taken from the U.S. Department of Health and Human Services’ website. IP69K information was taken from the ifm website. Next Article Looking for a gearbox solution for your mixer?